The building, slated to be completed by 2041, would be made of 90 percent specially processed wood, and 10 percent steel. 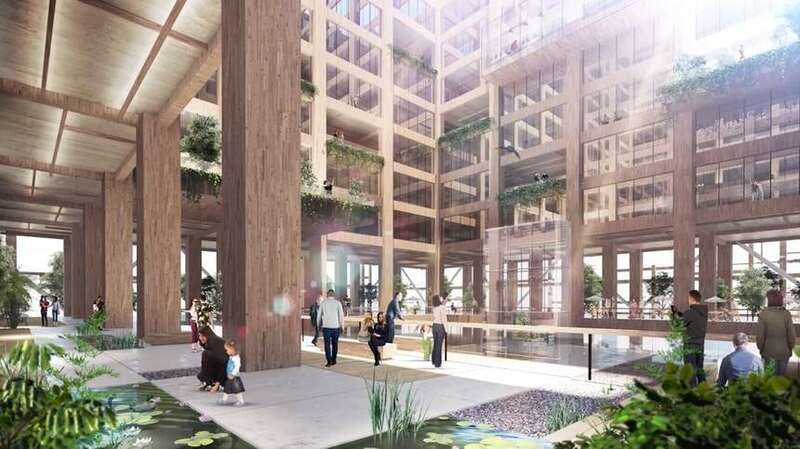 But it’s not your run-of-the-mill timber that’s going to be built so high into the sky — the building would likely be made of cross-laminated timber, a material made of many sheets of wood glued and compressed together. The final result is a plank that’s more robust than steel. If one of the little piggies built its house from this stuff, even to the heights of the W350 project, then no amount of the wolf’s huffing or puffing could take it down. 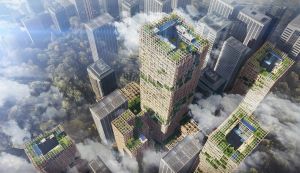 The W350 Project isn’t the first of its kind — other architects in cities all over the world have been toying with the idea of using wood as the main component for skyscrapers. But it’s not just the availability of the new material that makes it so appealing. So why build skyscrapers out of wood? We can think of a few good reasons. The production of typical construction materials, like steel and concrete, accounts for 16 percent of global emissions, according to a 2013 study published in the Journal of Sustainable Forestry. By switching to wood, we could reduce the emissions from the construction industry by up to 31 percent, according to a study from the Yale School of Forestry & Environmental Studies. And because wood is lighter and easier to transport than steel, it requires fewer fossil fuels to transport it, further reducing emissions. Cross-laminated timber costs about the same as concrete and steel. And again, because it’s lighter, builders can move a lot more of it for the same cost. While the W350 Project is expected to cost twice as much as an ordinary building, Sumitomo is confident that technological advances between now and 2041, when the building is expected to be complete, will drastically reduce that number. If managed properly, wood could become an accessible, practical building material for large-scale construction projects. The W350 Project may be the most recent endeavor to bring wood to new heights, but it certainly won’t be the last.